For the first time since 1960, US scientists will be able to explore the deepest parts of the world's oceans, up to seven miles below the surface, with a novel underwater vehicle capable of performing multiple tasks in extreme conditions. Researchers at the Woods Hole Oceanographic Institution (WHOI) are developing a battery-powered underwater robot to enable scientists to explore the ocean's most remote regions up to 11,000 meters (36,000-feet) deep. The hybrid remotely operated vehicle, or HROV, will be able to operate in two modes: as an autonomous, or free-swimming, vehicle for wide area surveys, and as a tethered, or cabled, vehicle for close-up sampling and other tasks. In the latter mode, it will use a novel fiber optic micro cable only one thirty-second of an inch thick, a major departure from the large heavy cables typically used with tethered vehicles. The deep-sea vehicle will require new technologies such as ceramic housings for cameras and other electronic equipment to withstand the pressures at the vehicle's extreme operating depths. Funding for the four-year, $5-million HROV project is provided by the National Science Foundation, with additional support from the US Navy and the National Oceanic and Atmospheric Administration. Principal investigators are Andrew Bowen and Dana Yoerger of WHOI's Deep Submergence Laboratory (DSL) in the Applied Ocean Physics and Engineering Department and Louis Whitcomb, an Associate Professor in the Department of Mechanical Engineering at Johns Hopkins University. Whitcomb is also a visiting investigator in DSL. The new vehicle will undergo initial trails in three years. The HROV will provide routine access for scientific research in areas of the ocean that are virtually unexplored - the deep trenches, which are some of the most active earthquake zones on earth, deep transform faults and under the polar ice caps. It will be compact enough for quick deployment from virtually any ship in the world for rapid response to changing environmental conditions, such as volcanic eruptions or earthquakes. Trieste descended with Don Walsh and Jacques Piccard. The Japanese remotely operated vehicle (ROV) KAIKO dove to the bottom of the trench in 1995. 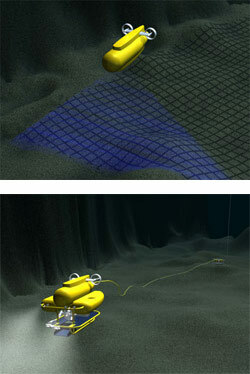 KAIKO was lost earlier this year, and no operational vehicles currently exist that are capable of reaching this depth. Unlike other vehicles, the HROV will be designed to be reconfigured aboard ship to operate in two different modes, depending on the scientific need. As an autonomous or free-swimming vehicle, the HROV will be launched from a surface vessel and descend through the ocean. During its journey to the bottom it will collect information and images, mapping and surveying the seafloor for up to 36 hours on battery power. This capability will permit scientists to examine broad areas of the seafloor efficiently and to find areas worthy of more detailed study. When its mission is complete, the vehicle will return to the surface where the stored data can be recovered and analyzed. When areas of further research interest are identified, the vehicle can be reconfigured in its remotely operated or tethered mode. This can be done on the same research cruise, thereby optimizing scientific return and avoiding lengthy delays in making important scientific discoveries. After transformation on deck to a remotely operated vehicle (ROV), the HROV is launched using an armored fiber optic cable and depressor. Once clear of the vessel and surface currents, the vehicle is released from the depressor at about 1,000 meters depth (about 3,300 feet) and free falls to the seafloor using a descent anchor assembly. During the free fall it pays out the fiber optic micro cable from two small canisters, one mounted on the depressor and the other on the descent anchor assembly attached to the vehicle. The HROV uses the fiber optic cable to communicate with the support ship but not to supply power. The small, lightweight cable, only one-thirty second of an inch in diameter and adapted from US Navy applications, allows the HROV to operate and maneuver at unprecedented depths without the high-drag and expensive cables and winches typically used with deep sea ROV systems. Once the HROV reaches the bottom, the descent anchor assembly is jettisoned and the vehicle continues its mission while paying out up to 20 kilometers (about 11 miles), of micro cable from a third canister mounted on the vehicle. Using two-way, real time communications via the micro fiber, the HROV is remotely controlled by an operator on the surface vessel. Mission durations are planned to be as long as 36 hours and include collecting samples, taking photographs and video, and conducting detailed mapping and seafloor characterization. When the mission is complete, the HROV jettisons the micro fiber and drops its ascent weights for the trip to the surface. Untethered, it guides itself to the armored cable depressor near the surface, latches onto the cable to the surface ship above and is recovered aboard ship. The micro-fiber is then recovered for re-use. "The HROV will enable, for the first time, routine scientific research in the deepest parts of the ocean, from 6,500 meters to 11,000 meters, a depth we currently cannot reach," says Richard Pittenger, WHOI Vice President for Marine Operations. "It will also afford access to other very hard to reach regions such as under the Arctic ice cap. The HROV's real-time, wide-band link to the surface will put the researcher in the loop to view, assess and command the vehicle throughout the duration of dive missions. It is the first capable and cost-effective technology that will enable scientists to pursue research projects on a routine basis in areas they have long wanted to study but have been unable to reach. HROV technology will help answer many questions about the deep sea." Woods Hole Oceanographic Institution (WHOI) is a private, independent marine research and engineering and higher education organization located in Falmouth, MA. Its primary mission is to understand the oceans and their interaction with the Earth as a whole, and to communicate a basic understanding of the ocean's role in the changing global environment. Established in 1930 on a recommendation from the National Academy of Sciences, the Institution operates the US National Deep Submergence Facility that includes the deep-diving submersible ALVIN, a fleet of global ranging ships and smaller coastal vessels, and a variety of other tethered and autonomous underwater vehicles. 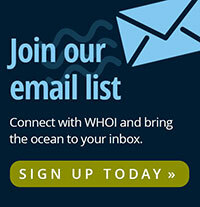 WHOI is organized into five departments, interdisciplinary institutes and a marine policy center, and conducts a joint graduate education program with the Massachusetts Institute of Technology.